Any comfy clothes will work for a Zumba® session – in class or at home. And a playlist of your favorite Latin tunes will provide just the right atmosphere. 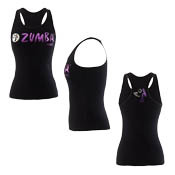 But if you want the togs and the music that were made to Zumba to, you can place an order direct from the Zumba® store. For a 10% discount on clothing, type in the code FITKAT at checkout.